Brian Michael Bendis is a certifiable modern day comic book legend. He has had a tremendous impact on the trajectory of Spider-Man, one of the most popular characters not just in comics, but in all of pop culture, over the years in the pages of Marvel Comics. Not only did he reinvent Peter Parker for a new generation with his Ultimate Spider-Man run, but he co-created the Miles Morales version of the character in 2011, who recently rose to prominence on the global stage in Spider-Man: Into the Spider-Verse. 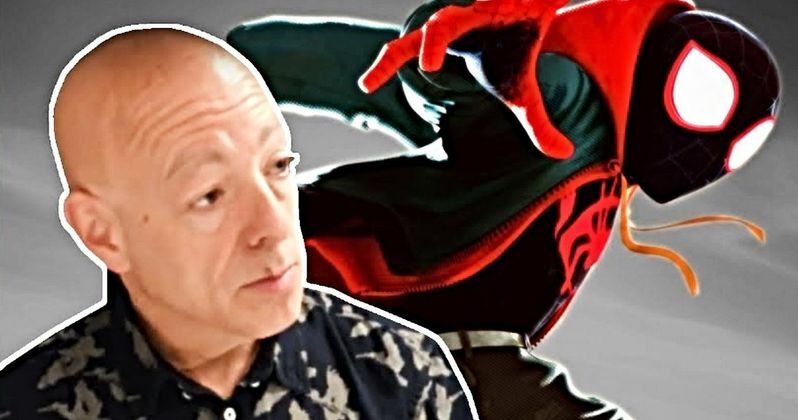 With the help of artist Sara Pichelli, Brian Michael Bendis provided the comic book world with perhaps his greatest gift to date; Miles Morales. For those who aren't familiar, Miles Morales took up the mantle of Spider-Man in the Ultimate Marvel Universe, which takes place outside of the main Marvel Comics Universe, after the death of Peter Parker. Miles is a young kid of African-American and Hispanic descent who has powers similar to Parker's Spider-Man. However, given his lineage, the character resonated with fans in a way that Peter Parker was never able to. The character first appeared in 2011 in the pages of Ultimate Fallout #4 and Marvel hasn't looked back since. Miles Morales quickly became a huge hit with fans and there has been demand to see him on the big screen right away. That took some time to accomplish and Sony finally gave us that gift in the form of Spider-Man: Into the Spider-Verse. While it may not be in the world of live-action, this animated feature delivered one of the most honest representations of Spidey we've seen to date. Sony has had its issues, in terms of quality, when it comes to Marvel adaptations. Not here. Spider-Man: Into the Spider-Verse, directed by Peter Ramsey, Bob Persichetti and Rodney Rothman, with The LEGO Movie filmmakers Phil Lord and Chris Miller producing, has been a runaway hit at the box office, bringing in $360 million worldwide. That was bolstered by near-universal praise. Said praise culminated with its recent win at the Academy Awards for Best Animated Feature. Not surprisingly, the studio is already hard at work on a sequel and a spin-off. While Peter Parker, Spider-Gwen, Noir Spider-Man and Spider-Ham are along for the ride, it's Miles Morales who carries the story on his shoulders and audiences have responded in a big way. None of that would be possible without the work of Brian Michael Bendis. In honor of the movie's home video release, I had the privilege to speak with the Eisner Award-winning comic book writer about Spider-Verse, his secretive Marvel movie with Tim Miller and much more. So, without further adieu, here's my chat with Brian Michael Bendis. Spider-Man: Into the Spider-Verse. You've got Miles Morales. You've got your creation, which has just totally taken off. You've worked with Marvel for a long time and usually you're kind of playing in other sandboxes, but this is your creation. How as it been to kind of see the world at large take to that character that you created? Brian Michael Bendis: It's a co-creation between myself and Sara Pichelli and Joe Quesada helped, David Walker helped. Collaboration is the name of the game in comics. It's insane. It's crazy to watch it. I have not fully unpacked what has happened. I haven't even gotten to Sunday yet. It's been a crazy couple months of dreams coming true that I didn't even dream. When I got handed that Campbell's Soup can with Miles Morales on it I literally said, "I had no idea how much I wanted this until I had it." I wish one of my characters would end up on a Campbell's Soup can! I never thought that until I saw it and then it was, "Oh my God did I want this!" That and like a Hot Wheels car. There's a Miles Morales Hot Wheels car. A lot of things in life, it's one of those things where you don't know you needed it until it shows up and then you're like, "Well, I needed that." Brian Michael Bendis: It's been such a constant source of joy. It's just opened my world up to people. Right now, all over my Twitter feed, people all over the world saying, "I just saw this movie" and having the exact emotional reaction to the character that I dreamt of. I was like, "I would like people to feel this way." In comics we were able to achieve it but with film obviously opens it up to an audience that would never have seen the character before and because the filmmakers were so honest and true, they're getting the exact feeling that I had hoped for. That is such a magical experience. I can't even relay to you how much I don't take this for granted. It is a constant feeling of overwhelming gratitude that hasn't left my body in months. It's a very strange feeling. As someone who had a big hand in creating this character, what is it you think makes Miles Morales resonate with people? Because I was always a Peter Parker guy and at first I was a bit hesitant, but it resonated with me too. But from a creator standpoint, what do you feel makes people gravitate toward him? Brian Michael Bends: This isn't Miles specific, this is specific to all characters. The more specific the details of the character, the more real and specific they are, oddly the more universal the story becomes. The idea we had behind Miles and his whole family, and his getting powers and not acting with them right away, all of that was our attempt to do the thing. So I was so relieved that that ended up being the case. That was the philosophy behind it but oh good! It worked! The more specific the details the more universal the truth. I suppose intention is interesting that way. You can intend for something to go one way, but you as a creator have no way of knowing if people are going to take it that way. Brian Michael Bendis Oh yeah. It's almost like storytellers are some kind of gambling addicts or something. Because you have no idea what the result is going to be other than you've really got to try your hardest every time. I have tried as hard as I've tried on Miles on other stuff and have not, for whatever reason, whether one little thing was off, it just didn't land. Then you go, okay, this was the perfect balance. It was that perfect mesh of Sara being from Italy and not really speaking English and coming from a fashion world, the way she came at the character's design. Everyone was bringing in their own unique perspective, which is what the filmmakers did. They were additive in every area. Like I told them, you reached something that I was desperately reaching for. I couldn't get there on my own. Someone had to step on my shoulders to get to it, right? I'm so glad I got to live to see that happen. I almost didn't. What I will tell you, this is all I know, they're better storytellers than I am. I wrote Rodney after the Golden Globes a very personal note of congratulations and the note he wrote me back was so much better, that it was a reflection of how much better his Miles is. I suppose being humble in that sense isn't the worst thing in the world. You definitely had a big hand in this. Brian Michael Bendis: No, no, no. I had a big hand in it. I can be both things. You're credited as an executive producer. When it came to the movie, how involved were you? Because you talked about teamwork before. What was your role in that team? Brian Michael Bendis: Animated things take a while. That entails them calling me for little things, calling me for big things. I remember like six months ago Phil Lord emailed me asking someone's birthday. When was Gwen's mother's birthday, or something. Then the next week I'd get a whole cut of the movie in an email going, "Take a look at this and give us elaborate notes." So, you get both things. The last part, may I say, they surprised me with the executive producer credit. That was not a contractually obligated thing on any level. Letting me share a producer card with Stan [Lee] was just about as nice a thing as they could do. Brian Michael Bendis: Yeah. For film nerds like you and me, we are film nerds, we know how important it is for filmmakers. So I took that very deeply. Sunday night it won the Oscar. How did you feel? I'm sure that's a stupid question, it's a simple question to ask, but can you try to describe that feeling? Brian Michael Bendis: I haven't unpacked it yet is the honest answer. I know myself well enough to know I have not unpacked this. I will say that I made the active choice to share the moment with my family and my friends. We've been through a lot the past couple years. Me and my wife both had some real medical situations. I almost didn't get to see any of this. So, I wanted to share it with the people that saved my life and that was a really magical night. Also, my kids are old enough now. They weren't when Miles was created, and some of them weren't even alive when Miles was created. My daughter said, "Oh my god Pharrell just gave Miles an Oscar." They get it. It was pretty cool. It was a pretty amazing experience to share with them. As a Spider-Man writer I don't feel like I'm wired to enjoy success. I imagine that's one of those crazy things in life, if you ever get to unpack it emotionally, it will take some time. That's one of those things you just can't prepare a person for. Brian Michael Bendis: I haven't fully unpacked that I was the writer of The Avengers. So I'm way backed up on the unpacking. Are there any other characters that you've worked with, or ones you've had a hand in creating, that you would like to see either in live-action or animation? Brian Michael Bendis: Well, all of them. I've been sitting with this feeling for a while. What happened to Spider-Man with the language of Spider-Verse, I think that's a language that could be applied to Superman. I think there's a different language that could be applied to all kinds of different characters that have so wildly succeeded in comics because comics are unbridled imagination and artistic craft. That being applied to cinema, with these characters, could be very exciting. You're writing a Marvel movie. I'm assuming you can't say almost anything about it. Brian Michael Bendis: I'm writing a movie for Fox. Anything at all you can give me on that? Brian Michael Bendis: Here's what happened. The other night, I'm actively writing it right now actually, I took a dinner break the other night and hopped on Twitter to see what was going on and someone said, "Hey, what's going on with that movie you were doing with [Deadpool director] Tim Miller?" And I wrote, "Oh, I'm actually working on it right this second." And I didn't realize that there hadn't been any update in a while, and that made a lot more news than it should have. So, I think that's the thing I'm working on right now because that really made more noise than it should have. That's unfortunately how those things work sometimes. Brian Michael Bendis: I would give you more details but I didn't realize even the act of making it was news. Not because it's a big deal that I'm writing a thing. It's because of everything that's going on with Fox and Disney and what shape that all is. And I really don't know any of that. So for me to comment on it would be ridiculous. I will say this; I'm writing something. I'm having a lot of fun writing. I'm having a blast. We'll have to wait to see what happens with that once the dust from the Disney/Fox merger settles. In the meantime, Spider-Man: Into the Spider-Verse is available on digital platforms now, with the 4K Ultra HD and Blu-ray/DVD release scheduled for March 19 from Sony Pictures. This interview has been edited and slightly condensed for clarity.